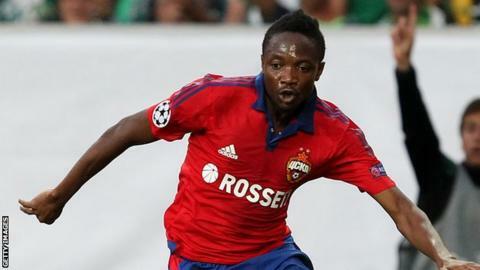 Russian club CSKA Moscow have rejected an improved offer from Premier League leaders Leicester City for Nigeria's Ahmed Musa, BBC Sport understands. Moscow turned down a new bid of $26.5m (£18.7) which was an improvement on the original offer of $21.6m (£15.1m). The 23-year-old is believed to be open to a move to Leicester. The Nigeria captain has also attracted the attention of other top Premier League teams and has a $32.5m (£22.8m) buyout clause in his contract. His current deal with CSKA Moscow runs until 2019. Leicester are expected to return with an improved bid for the player before the transfer window closes on 1 February. A former VVV Venlo player, Musa has scored 10 goals in 29 games this season and 11 times in 56 appearances for Nigeria. Musa, who made his international debut against Madagascar in September 2010, scored twice in Nigeria's 3-2 loss to Argentina at the 2014 World Cup in Brazil. He scored the county's fastest-ever goal at a World Cup - netting after four minutes - before becoming their first player to score twice in one game at the tournament.